Buying reusable diapers is only one part of the cloth diapering process. These are the 6 cloth diaper accessories that you absolutely must include in your cloth diaper stash. Do I really need ALL these diapers and accessories? This post is aimed at both of these types of buyers because I’m sharing exactly what you REALLY need in your cloth diaper accessories stash. While you’ll probably have inserts in the cloth diapers you purchase, it’s always a good idea to have extra inserts. These can be used as doublers, giving you more absorbency. There’s no need to go overboard, though. I would recommend having just a couple extra microfiber inserts and a couple of hemp inserts. Believe me, you NEED these hemp inserts – they’re trim and amazingly absorbent. Liners are also a great accessory to have on hand when you need to use diaper creams. They’re also great for travel as they make clean up a snap. A wetbag is a must if you’ll be using cloth diapers away from home at any point. They also double as a great way to pack your clean cloth diapers when you’re traveling AND a great way to transport wet bathing suits after you leave the pool. A large hanging wet/dry bag like this one can double as a diaper pail when you’re away from home. 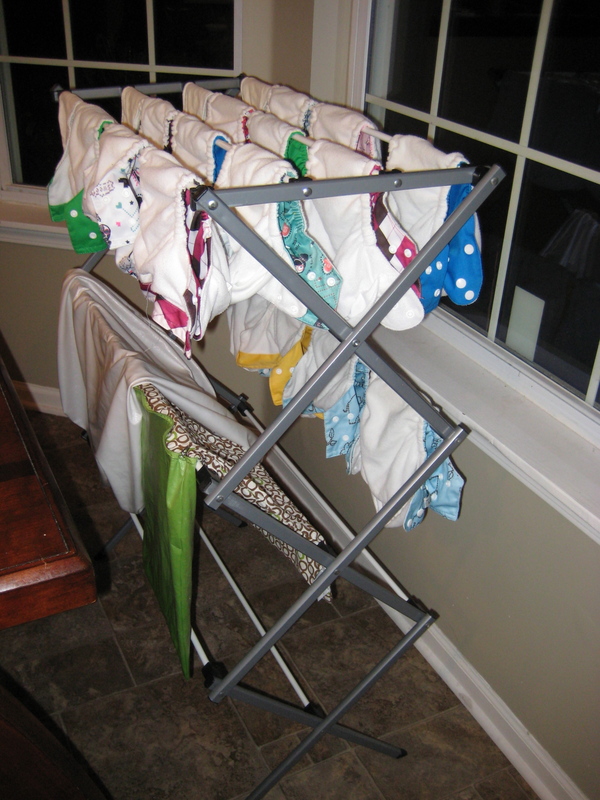 This is my favorite cloth diaper accessory because I love to let my diapers dry in the sun! Not only is it more energy efficient, but harnessing the power of the sun will help naturally bleach your diapers to help with stains. Plus it folds flat for easy storage when you’re not using it. Really, use them. They go hand in hand with cloth diapering and you won’t find anymore disposable wipes in your washing machine. You will need a good space to store the dirty cloth diapers of yours. You do not have to invest in an expensive pail! Reusing an old trash can or even a laundry basket has saved my life for years. You simply need a large wet bag to place them in so nothing seeps out. A diaper sprayer really should be at the top of everyone’s cloth diaper accessories that you REALLY need. A diaper sprayer will help keep your cloth diapers from staining and keeps your hands [and diaper pail] cleaner. I found a sprayer to be especially helpful for getting tough poop stains out so I would NEVER think to go without! While there are lots of cloth diaper accessories on the market, this list of 6 are accessories that you REALLY need for your stash. They’ll make your cloth diapering experience, easier, cleaner and help to extend the life of your cloth diapers through potty training your child!